Every Cub Scout deserves a trained leader. Cub Scout leaders are considered trained when they have completed Cub Scout Leader Specific training for their position. Whether you have volunteered to be a Den Leader, Cubmaster, or member of the Pack Committee, there is a specific training course for you. Volunteer leaders are required to complete the specific training course for their position and are invited to complete the training modules for the other Cub Scout leader positions too. For more information, contact the Training Team by email at Training@AlamoAreaBSA.org. 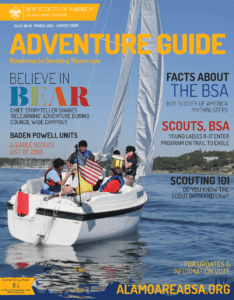 Click here to access My.Scouting.org, the BSA Online Learning Center, and complete the required training course for your position. Cub Scout leader training courses are also available in person. These courses are offered by district volunteers throughout the year.